The importance of windows | Sydney House. As Andy Dwyer said in Parks & Recreation, “Windows are the eyes to the house”. Although he’s a slightly offbeat TV character in our favourite TV show, he’s not half wrong. Typically Pettit & Sevitt homes were characterised by floor to ceiling (or to beam) windows and doors. 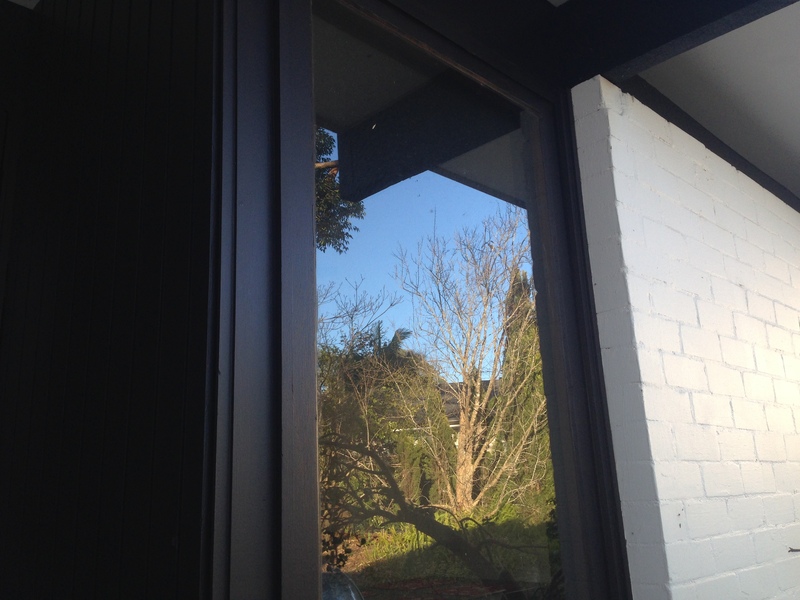 Many of them are ‘glimpse’ windows…only 865mm or 900mm wide and they’d be found in bedrooms or living areas. Most commonly they were Stegbar cedar windows of the day, and P+S houses cleverly placed many such windows at the corners of the home. At almost every corner of our house, there is a window. A brilliant way to save on a build by not building actual corners and it gives a beautiful outlook into areas of the property where we might least expect it. Really large scale floor to ceiling windows were reserved for the well-to-do in the 1960s. Swathes of glass would have blown out the cost of building the average economical P+S house. 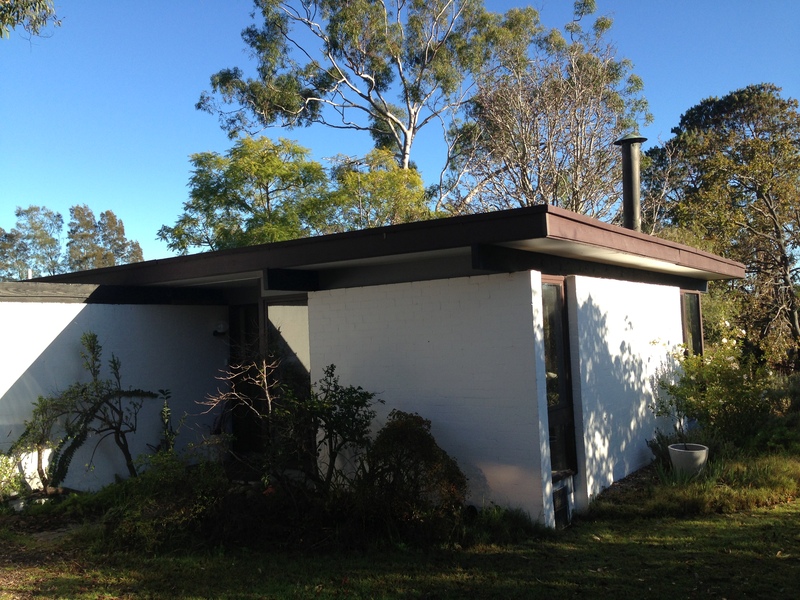 A P+S house was generally modest, comfortable and – of course – stylish and modern. So it was with this in mind that our architect designed our extension areas. The new master bed, bathroom and living spaces upstairs would have several ‘glimpse’ windows which give us beautiful views into the trees, the sky and clouds but retain our privacy to the road and rear. Our ‘big’ window views would be reserved for the rear of the house and, especially, a large door for the living extension – a total luxury in our budget and in our minds. But a necessary function of orienting the living space to the rear and out to the planned deck and pool. It’s designed to span a considerable 5.5 metres. The existing house had only a 2.6 metre rear opening and we’ll keep that as-is. So, how were we going to do this? Our first port of call was to look at the all the windows one could easily get access to at Home Shows and similar. Stegbar was an obvious reference point as well – because many P&S houses had original Stegbar windows and doors which could still be ordered today. A quote from Stegbar however, pretty much blew our socks off. It was expected in some sense – after all, windows are a major part of the house. But for only half the number of windows and doors we needed, the quote was well over $30,000. 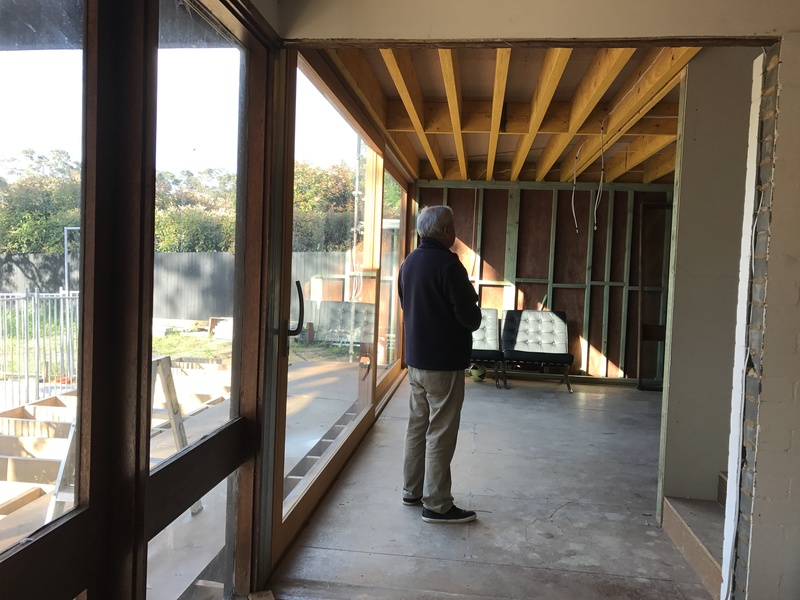 It hardly made sense as the quote was for aluminium windows in the new extension area…but this being Sydney, prices are whatever the market has no-choice-but-to-pay. We were determined to think about it more and it meant curbing on the design or building in phases. We decided not to build the playroom – a part of the extension designed to improve the size of the tiny kids bedrooms without re-arranging the house. It would have been accessed from their windows (once they became doors) and would run the length of the rear, looking out to the garden…almost sunroom-like. It’s nice features included windows opening right up to the rear for the the breeze, and an end to end desk where they could do all kinds of art, homework and play. But leaving this room off the build and continuing the deck off those rooms instead would retain the original look of the rear of the house and save us 10 metres of windows. I was sad but it was a solution nevertheless. Our rationale was that the kids didn’t have to have more indoor space (although storage was a big loser in the decision) but they would enjoy having their own outside hub on the deck to hang out with friends as they got older. Sometime between getting the DA and assessing window pricing, we also visited architect friends Virginia & Hamish in Armidale, for a holiday break. In the midst of catching up, they offered to introduce us to a local company Moar Windows & Doors. They raved about a Lift & Slide door and wanted us to see it at the Moar showroom. As we had a 5.5 metre door to consider in the plans, finding a lightweight smooth door mechanism was worth thinking about. And Moars specialised in timber windows too. It was always going to be a question of sleek brushed aluminium windows to the extended P&S sections, or timber…to compliment the original. 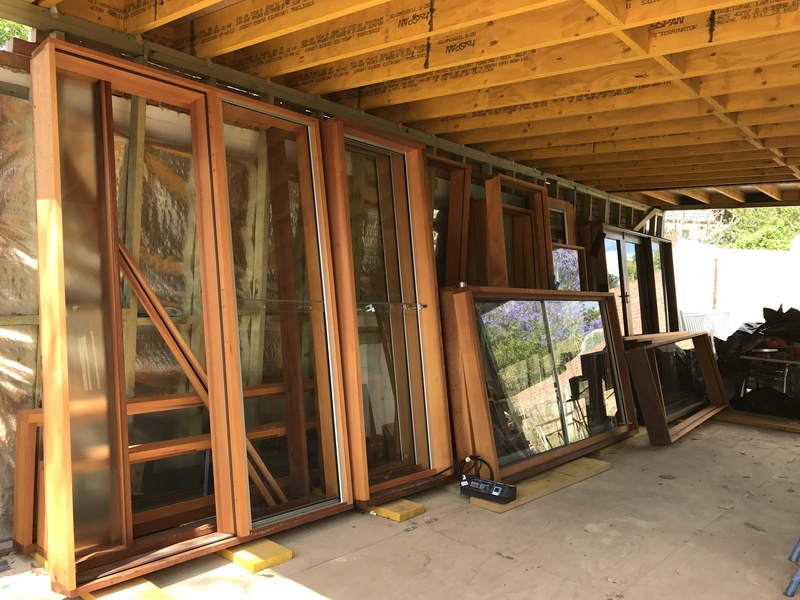 What we saw at Moars gave us hope that it might be possible to go with timber windows for the extension and the Lift & Slide technology for the large cedar door was impressive. We set to work with window schedules and quotations. We’re happy to say this turned out to be awesome. Moars advised us on the technical aspects of windows along the way (so much to know!) and it gave us full appreciation for the complexity of windows and window making. Moars are making superior products for, what we believe, to be fair prices. So much so, that we have been able commission Moars to make the replacement windows for the existing house. We went for cedar sashless windows through out to tie the old and new parts of the house together and bring it up-to-date. Importantly, Moars advised us on the best choice of glass to help comply with Basix and make the house more energy efficient overall. 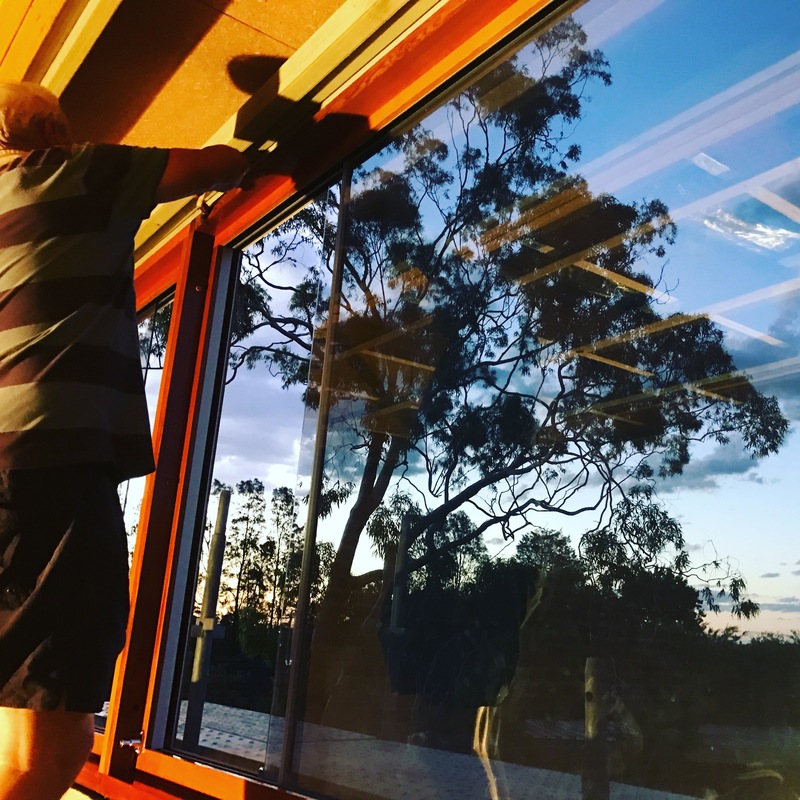 In areas where the house faces NW, N or W, we are using Viridian Comfort Plus or Comfort Neutral Low E glass for example and in other areas it is standard 6mm toughened glass. This has turned out to be a better outcome than re-conditioning the original windows – which we had considered. The original windows were 52 years old and did not have a big enough rebate to fit todays 6mm toughened glass. A word of warning: We did have 1 mishap with our windows and doors. Our largest door arrived in the wrong size. From the window schedule to the quotations to the emails and beyond, it’s paramount to check, measure, re-check, re-measure and do that at least 10 times. Even if you, the architect or the builder has checked it before, all sorts of crazy can happen when pen hits paper. Being human, this is a classic mistake. So re-measure the architect’s drawings and quotations you’re working with. This was a sort of “Grand Designs” disaster for us, but we recovered. We decided to keep the door, and use it for a studio. And re-order the right size big door. It took a while to come to terms with. Lots of deep breathes. But an extra $10,000 later, it’s been worth it. Adding an extra coat of Sikkens cedar oil one night. This has been challenging because Summer has been too hot. Temps need to be a moderate 20-25 degrees. 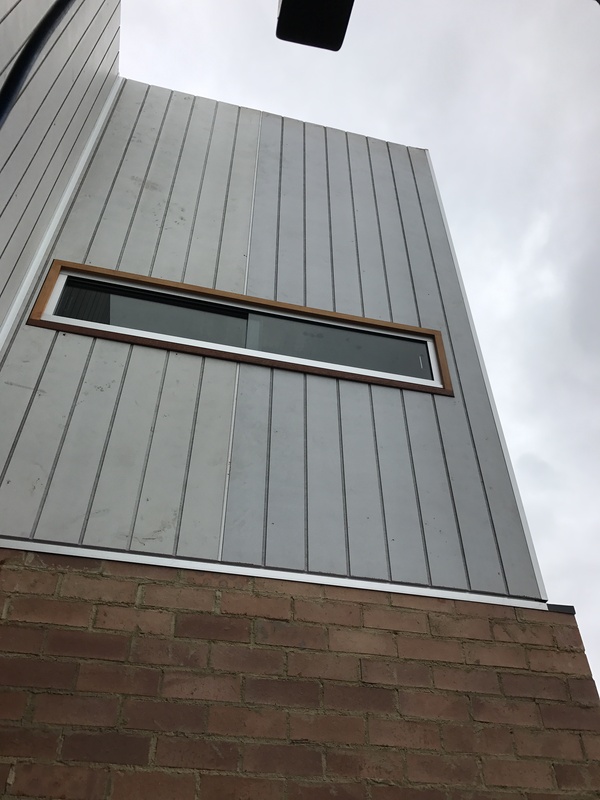 A horizontal sashless peek-a-boo window upstairs, shown with unpainted cladding.